This creamy potato and roasted garlic soup has a story behind it. My friend Jane is one of the people who has a standing invitation to come over for a casual bowl of soup and a glass of wine. One evening she called and said that she had met a new friend, an interesting Turkish writer who was visiting our valley on a writer’s retreat. Fifteen minutes later I got an e-mail. The lonely Turkish writer was fiercely allergic to onions, leeks, scallions, shallots, and green onions. Only garlic was all right. “I can’t imagine that any soup you have in the fridge doesn’t have one of those in it,” wrote Jane, her mournful tone seeping out of my computer screen. Too true. But I couldn’t get that poor woman out of my mind. 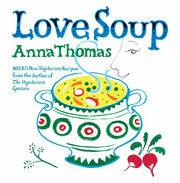 Was it possible to make a tasty, savory soup with no onions, no leeks, no shallots? The rustic garlic soup I used to eat in Spain came back to me, and I started thinking about creamy potato and roasted garlic soup, about roasted garlic and sauteed garlic, about garlic soup served with garlic toasts. 2. Peel the loose outer husk off the head of garlic, slice off a tiny bit of the top, place the garlic on a square of aluminum foil, and drizzle a little olive oil over it. Fold the foil up and crimp to seal it. Roast the garlic for about 40 minutes, or until it gives when pressed. Allow it to cool. 3. Meanwhile, peel and dice the potatoes, cut the celery into small dice, and combine the vegetables in a soup pot with 3 cups (750 ml) cold water. Add the thyme, bay leaf, 1 teaspoon salt, some black pepper, and a large pinch of red pepper flakes. Bring the water to a boil, lower the heat, and simmer, covered, for 15 minutes or until the vegetables are completely soft. 4. 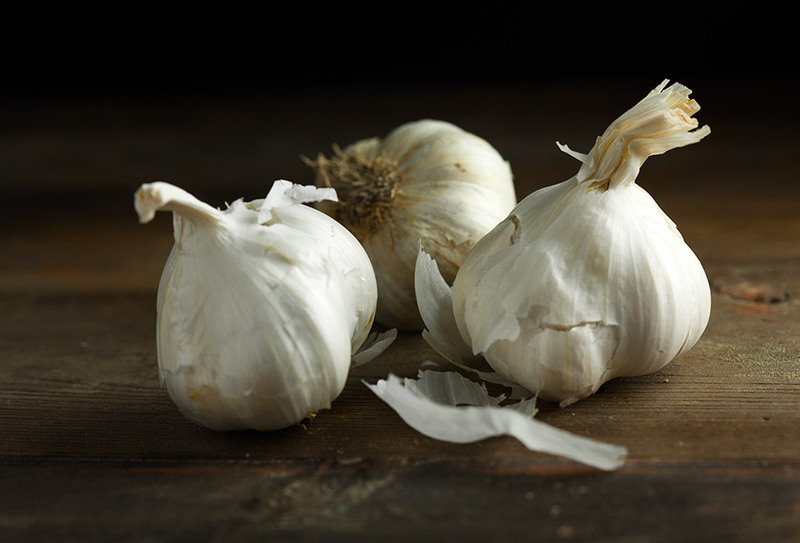 When the garlic is ready, squeeze the soft roasted cloves out of their skins and add them to the soup. Stir in the milk and puree the soup in a blender, in batches, or with an immersion blender, but be careful not to overprocess. Stop the moment the vegetables are smooth, or the potatoes could turn gummy. 5. Return the soup to the pot, and stir in enough vegetable broth to give the soup the consistency you like. Taste, and add salt and pepper if needed. 6. Trim the kale, slicing away the tough stems, and cut it into 1-inch squares. Heat 1 tablespoon olive oil in a nonstick pan and stir the chopped garlic in it for a minute or two, just until it begins to color. Add the kale and saute it, stirring constantly at first, then frequently, until it thoroughly wilts. Add a splash of water—just a few tablespoons—then cover the pan and let the kale steam until the water is gone and the kale is tender, 5 to 6 minutes. Stir the kale into the soup. 7. Drizzle about a teaspoon of the remaining olive oil over each serving of soup and serve with Parmesan or garlic crostini. If reheating, do it gently, and stir the soup from time to time to prevent scorching. Add a little cream in place of some of the milk if you want a richer soup, or stir in some creamy goat cheese and let it melt into the soup just before serving. This is one of those soups that should definitely be added to your repertoire. With such inexpensive ingredients, you create a soup that has complex flavors worthy of sharing with friends. Add the Parmesan cheese and the olive oil, and you’re set. This simple soup also has lots of options. Serve as is for a lovely vegetarian dish or reserve some of the diced potatoes to make it a chunky soup. Add clams, shrimp, crab or a good garlicky sausage and you’ve got a hearty dish to chase away winter chills. I’m sold. Creamy Potato and Roasted Garlic Soup Recipe © 2009 Anna Thomas. Photo © 2015 David Leite. All rights reserved. All recipes and photos used with permission of the publisher.